A.J. 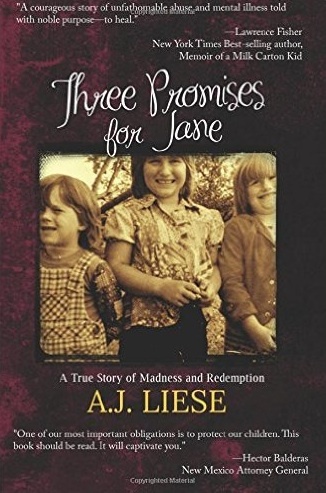 Liese, English professor at San Juan College in Farmington, will be at Page One Books 3pm Sunday, March 20, to talk about and sign her memoir, Three Promises for Jane: A True Story of Madness and Redemption. The book is described as such: "Years ago, I wrote how truth is anything but beautiful and how the deep well of an innocent child’s broken, bruised and neglected heart is seldom untruthful. I’m not penning victimhood. I take full responsibility for the choices I made after I was released from under my parents’ broken wings. But I do hold them accountable for my early years: the foundational part of my life that influenced and shaped my young mind. I wish they would have given me something more than a shattered compass and ring of useless keys for life. As a small child, I felt lost—freakish, as if an indelible, scarlet-red mark had been placed on me, and I was walking aimlessly throughout life without any sense of direction. Like the only rule was: there are no rules. You just survive." Liese is an English professor at San Juan College in Farmington, NM. She is a columnist for The Farmington Daily Times and has written four developmental children’s books for parents and educators. Liese is an education doctoral student, specializing in rare childhood syndromes and mental disorders. She and her husband enjoy hiking together in Colorado.